Iver Johnson (the man) was a Norwegian gunsmith who emigrated to the United States in 1863, settling in Worcester, Massachusetts. In 1871 Johnson formed a partnership with another gunsmith, Martin Bye, and formed Johnson Bye & Company. In 1883 Johnson bought out his partner’s interest and renamed the company Iver Johnson & Company. In addition to developing several firearms-related patents, Johnson also designed firearms for other New England manufacturers. In 1891 the company relocated to Fitchburg, Massachusetts, and changed its name to Iver Johnson’s Arms & Cycle Works, to reflect the company’s diversification into the bicycle industry in addition to its firearms manufacturing. Upon the death of Iver Johnson in 1895, the business was taken over by his three sons. They continued the diversification begun by their father, eventually progressing from bicycles to motorcycles. Eventually, though, the company shed the non-firearms segments to focus on what today’s Wall Street gurus and MBAs would call its “core business.” The “Cycle Works” reference was dropped from the company name when that segment of its operations was spun off. The Johnson sons eventually faded out of the company and it went through a series of owners. In the latter half of the twentieth century the company relocated, first to New Jersey and then to Arkansas. 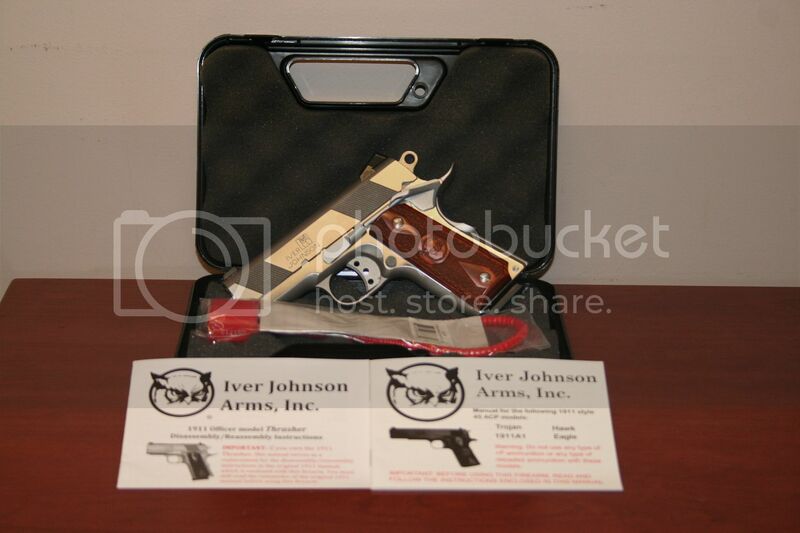 In 1993 the Iver Johnson name was owned by American Military Arms Corp and, according to some sources, ceased to operate under the Iver Johnson name. Approximately eight years ago, both the company and the name were purchased by the current owners, and the Iver Johnson name was brought back. The current Iver Johnson Arms Company doesn’t sell any motorcycles, but they do offer an expanding lineup of intriguing firearms. While supplies last, they have an American-made version of the classic .25 ACP Baby Browning pocket pistol, a convertible self-defense pump shotgun … and a full lineup of 1911s, ranging from full-size (5-inch) models down to subcompacts. Several models are available in 9mm Parabellum as well as in .45 Automatic. 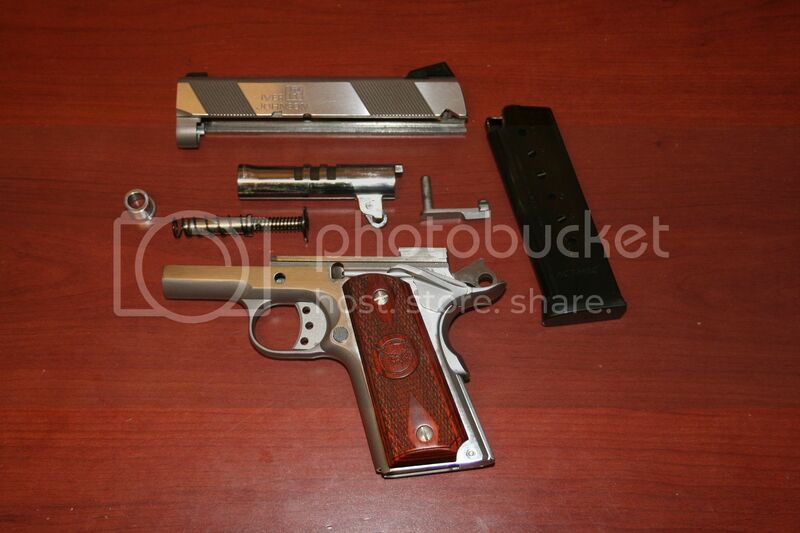 The M1911 Pistols Organization previously reviewed the larger Trojan model three years ago. Now we have been offered an opportunity to review a newer subcompact 1911 based on the shorter Officers ACP-size receiver and bearing a 3⅛-inch slide and barrel. Right around the turn of the year, Iver Johnson sent us one of their deluxe, polished stainless steel compact models, named the “Thrasher.” It is a beautiful pistol and a real eye catcher but, as my wonderful grandmother used to say, “Handsome is as handsome does.” A beautiful pistol is worthless if it doesn’t shoot well and reliably, so we were anxious to put the little gem through its paces. Regrettably, this year’s version of the flu put a damper on my shooting for a period of several weeks, but we have now had some time to get acquainted with the Thrasher and to shoot it both for accuracy and just for fun. Read on to find out how it fared. The Thrasher arrived in a modest but serviceable plastic, clamshell pistol box with an eggcrate foam liner, two plastic latches, and a hole for a padlock. Inside the case, the pistol itself was enclosed in a plastic bag and was fairly wet with oil to protect it during shipping. In addition to the pistol we found a cable gun lock, a general instruction book for 1911s, and a supplemental owners manual for the Thrasher. The latter is necessary because the pistol does not have a conventional barrel bushing and recoil spring assembly, and therefore the disassembly procedure is different from that customarily employed with a Government Model or a Commander. 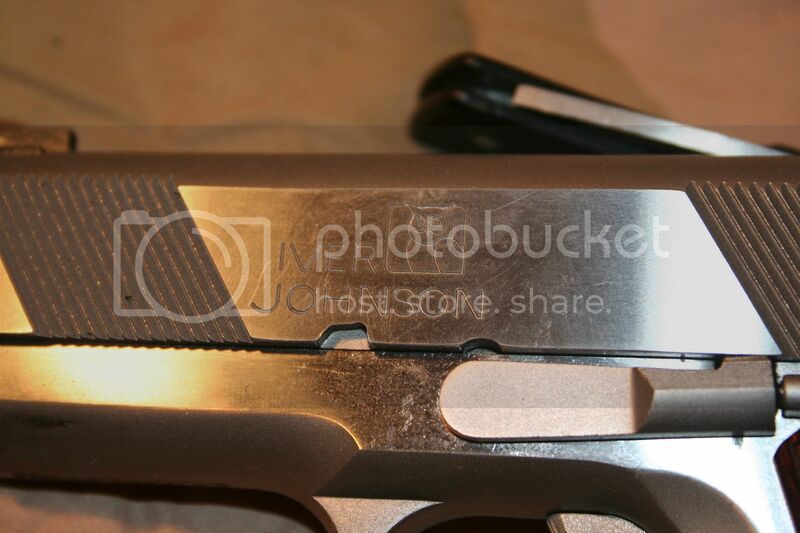 Both on their web site and on the pistol case itself Iver Johnson refers to the Thrasher as an “Officers” pistol. This is, presumably, a reference to the original compact 1911, the Colt Officers ACP. 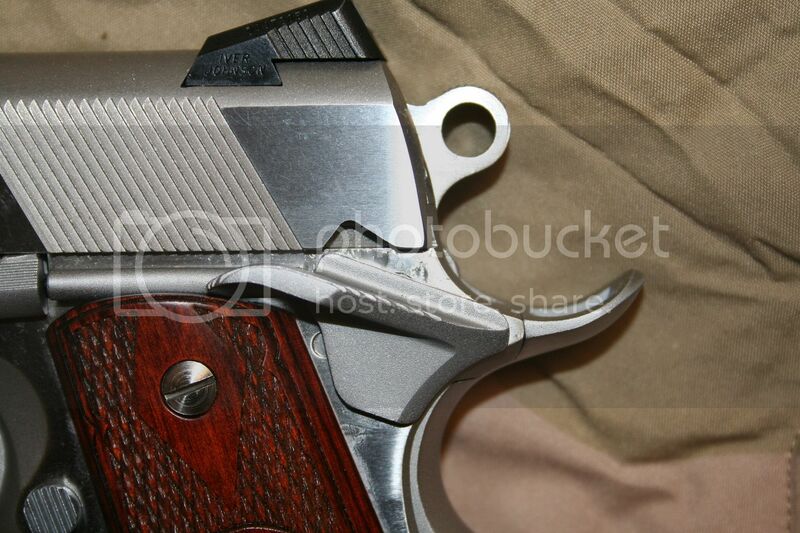 However, the Colt Officers ACP (long since discontinued) had a 3½-inch barrel and slide. The Iver Johnson Thrasher has a slide and barrel measuring just 3⅛ inches in length. 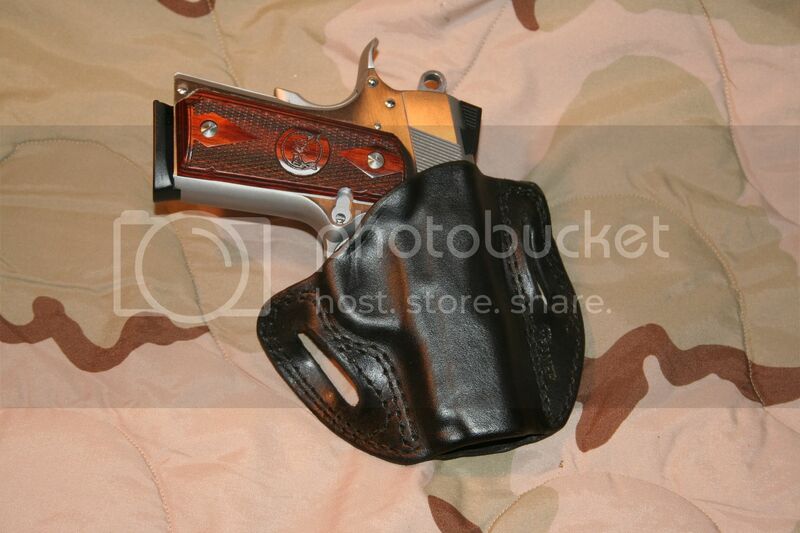 This makes it much closer in size to the Colt Defender than to the Officers ACP. Considering the rapidly expanding number of people choosing to carry concealed firearms today, this size is a sensible choice, as it is easily concealed and easily carried. The grip frame is the same size as that of an Officers ACP. The test pistol arrived with one 7-round magazine, manufactured by ACT. As we’ll discuss below, we also shot the pistol with a variety of other Officers-size magazines. They all fit the grip frame perfectly, demonstrating that the frame dimensions are “standard” for an Officers or compact size 1911 pistol. The Thrasher is an all steel pistol. 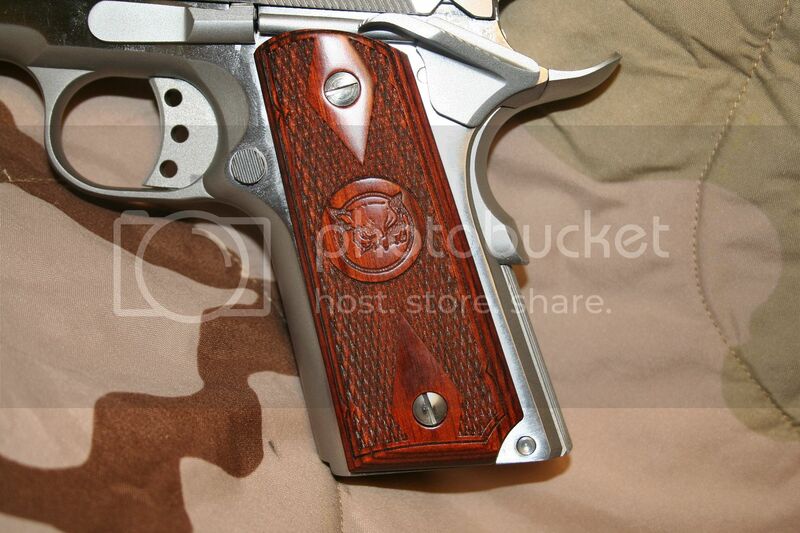 Our test pistol was the deluxe model, with polished flats and bead blasted curved surfaces. The slide carries slanted cocking serrations at the front and the rear. 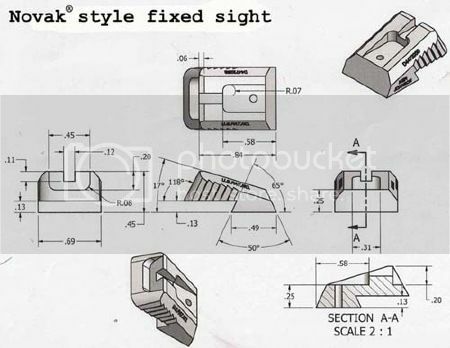 The rear sight is a Novak-style, wedge-shaped “combat” sight, and the front sight is a conventional blade set in a transverse dovetail. The test pistol came with a beautifully finished set of hardwood, double diamond checkered grips bearing the Iver Johnson logo, an extended thumb safety, and a beavertail grip safety with a “speed bump” at the lower end. 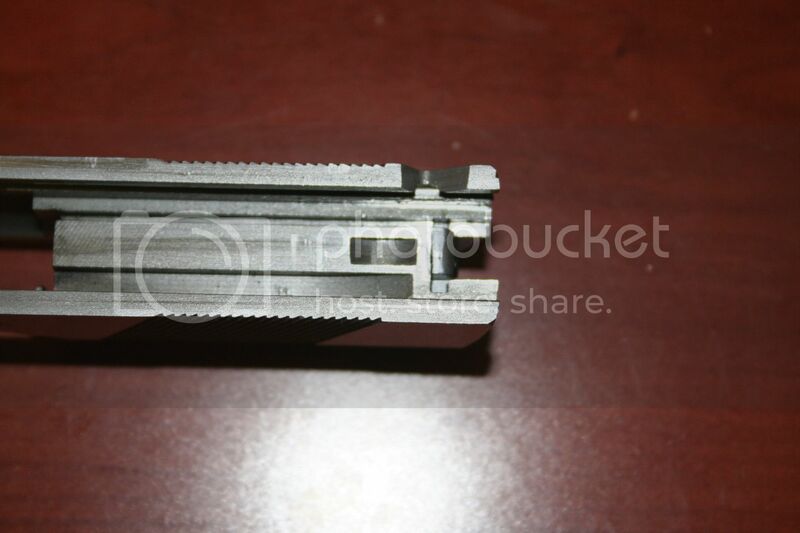 The mainspring housing is flat, and vertically serrated rather than checkered. 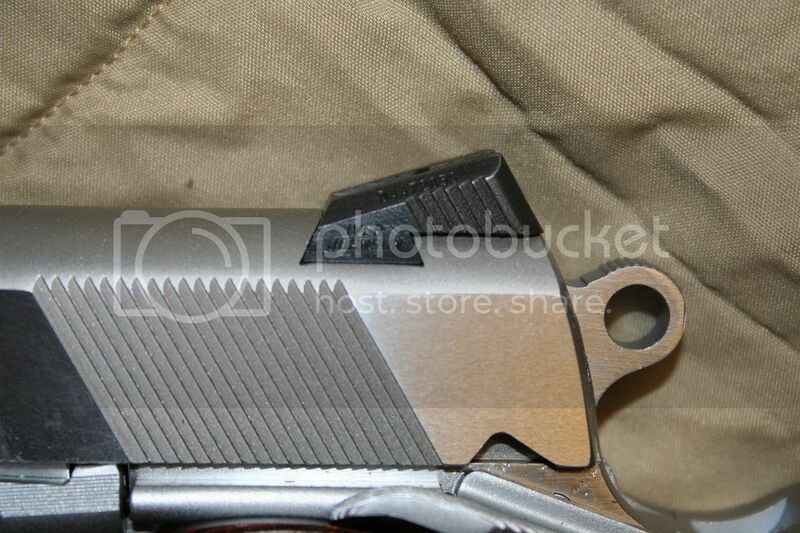 The Thrasher does not utilize a firing pin safety, as can be seen by looking at the underside of the slide. As is typical for most short-barreled 1911s today, recoil is handled by a dual-spring recoil assembly riding on a thin, full-length guide rod. Field stripping requires a bit of manipulation to keep the recoil assembly under control while removing the slide and barrel from the receiver together; there is no retainer tool to capture the spring in the compressed position while field stripping. Even so, taking the pistol down is straightforward and easy to accomplish once the technique has been mastered. It is different from the standard procedure for the original M1911 with a conventional barrel bushing, recoil spring plug, and short recoil spring guide. The supplemental Owners manual explains those procedures that are specific to the Thrasher model. We were pleased to find that the Thrasher came with a traditional, round-hole, Commander-style hammer rather than the newer elongated loop style favored by many manufacturers. The slide stop, too, is of traditional design and fully functional, while being (in this author’s opinion) better suited to holster carry than an extended slide stop. The extended thumb safety is narrow enough that it is unlikely to cause problems when holstered, yet wide enough and sufficiently serrated to operate surely when needed. The trigger shoe is curved across the front face and then serrated. Many aftermarket triggers have a face that is flat and serrated, which results in the outer corner digging into the shooter's trigger finger. This trigger was very comfortable, even through extended shooting sessions. The trigger is not equipped with an overtravel adjustment screw, and we applaud this decision. 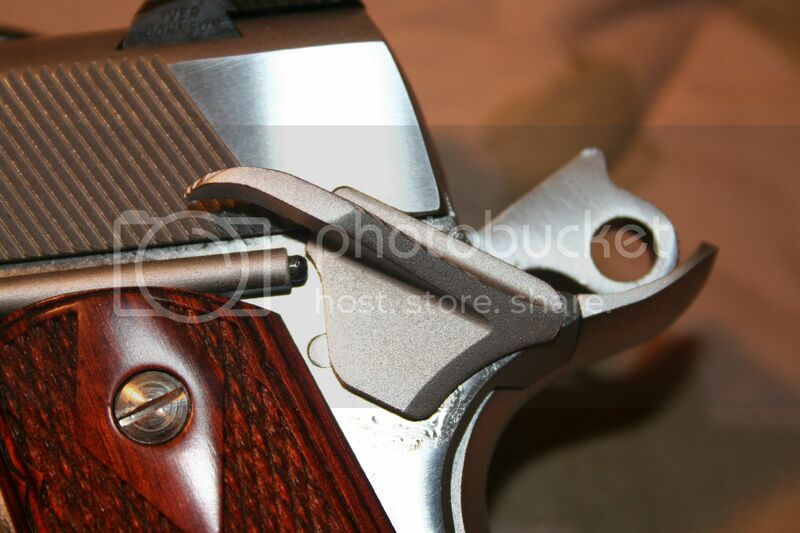 Too many owners of 1911s mistakenly believe the screw is to adjust trigger pull weight or take-up and they immediately start playing with it, only to wonder why their new pistol suddenly doesn't work right. This is not a bullseye pistol; it doesn't need overtravel adjustment, and Iver Johnson was right to omit it. 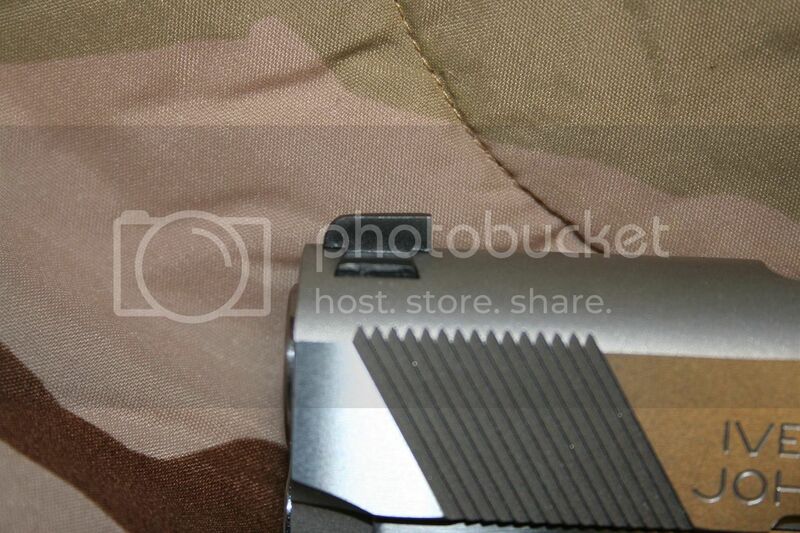 Also as is fairly typical of subcompact 1911s, the barrel itself mates directly to the slide, with no barrel bushing. The barrel configuration is a reverse cone shape, tapering down from the muzzle to provide clearance for the barrel to tilt down as it unlocks from the slide during recoil. The fit of the barrel to the slide and of the slide to the frame was impeccable. 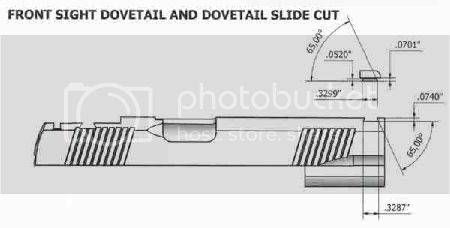 The slide glides smoothly through its entire length of travel, yet when the pistol is in battery there is no perceptible "slop" between the slide and frame, neither vertical nor horizontal. Our standard testing protocol here at M1911.ORG has always been to test pistols of Commander (4¼-inch) length and larger at a distance of 75 feet (25 yards, or approximately 22.9 meters), and anything with a shorter barrel at a distance of 25 feet (7.6 meters). The basis for this is the generalization that, while full-size and Commander pistols may be used for target shooting as much as for self-defense carry, smaller/shorter pistols are more likely to be carried for self-defense, and most self-defense shootings occur at distances of less than 25 feet (actually, most occur at less than 21 feet). Accordingly, we conducted our accuracy tests at a distance of 25 feet, shooting from a seated position off a rest. We ran six different types of ammunition through the Iver Johnson, firing multiple five-shot groups with each type. After discarding the worst shot from each group, we measured the group size for the best four out of each five shots. The table below reflects the best group for each type of ammunition, and also the average of the best three groups. What the table doesn’t show is a couple of interesting things. First, even though in theory all 1911s should feel the same in the hand, and certainly all 1911s of approximately the same size should feel much the same, for some inexplicable reason the Thrasher simply felt “better” in my hand than perhaps any other pistol I have ever shot, except one. 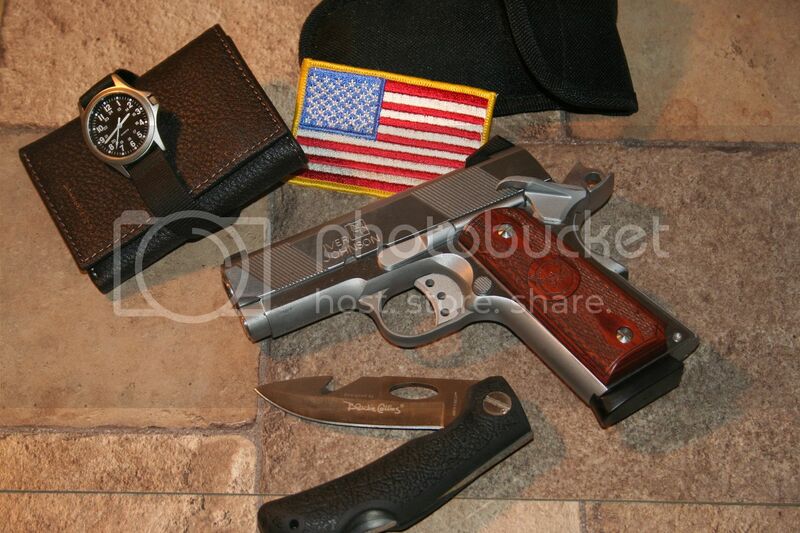 (The one exception is a Colt Mark IV Officers ACP belonging to a good friend). One of the pistols in my normal carry rotation is a Colt M1991A1 Compact, which has the same frame size and almost the same weight as the Thrasher, so the sensation that the Iver Johnson felt “good” was a surprise. The other surprise came after shooting for groups. 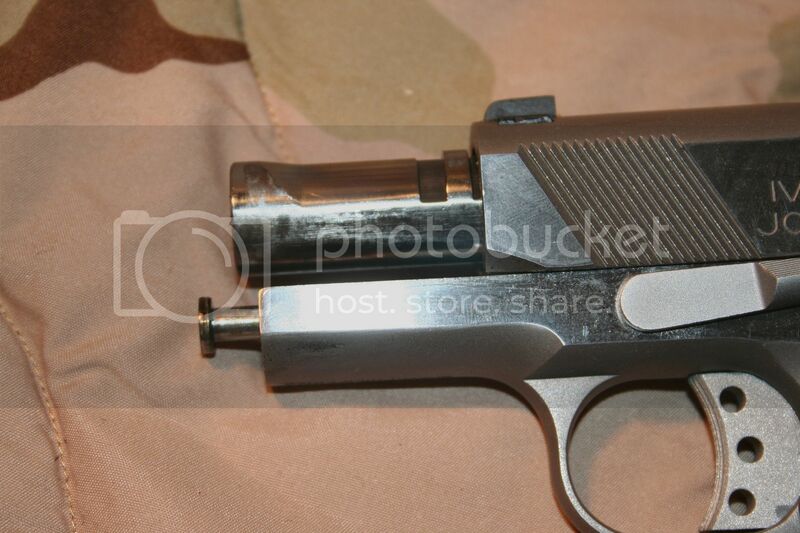 This pistol was extremely easy to shoot well, and extremely easy to shoot consistently well. After shooting multiple groups with each type of ammunition, all the groups were very close in size. I can’t speak for other testers, but I usually have some groups that are “meh,” one or two groups that are pretty good (after discarding the inevitable flyer), and a few groups that I’d prefer not to discuss. That didn’t happen with this pistol. There were simply NO horrible groups, and what was a “meh” group with the Thrasher would have been an exemplary group with some other pistols. And, to put this into perspective, I am still recovering from a very severe bout with the flu, that kept me out of work for over three weeks and which had not allowed me to shoot at all for nearly two months before the day I shot the Thrasher for accuracy. Consistency? Every group I shot with Federal American Eagle (which is decent plinking ammunition, but hardly what I’d choose for bullseye competition) measured 1-inch. It just doesn’t get any better than that. The absolute worst groups of the entire day were two that measured 1¼-inch. The ACT magazine provided with the pistol functioned nearly flawlessly through an entire afternoon of shooting. We ultimately experienced a grand total of two failures to return to battery, and those were easily cleared with a gentle nudge to the back of the slide. Since availability of magazines (like everything gun-related these days) is more or less “catch as catch can,” and even more so for Officers-size magazines, we also tested the Thrasher with three of our own magazines, obtained from different sources and at different times. These included a blued Metalform magazine that began life as a 7-round and was converted by yours truly to an original, 6-round capacity by swapping in a standard GI pattern, dimpled follower; a genuine Colt stainless steel Officers ACP magazine with the original 6-round capacity and GI follower; and a stainless steel Check-Mate magazine equipped with the patented, skirted Check-Mate follower. Although we didn’t run as many rounds through these other magazines as we did the OEM magazine, all three functioned perfectly during our testing. My only issue with the pistol is that the trigger pull out of the box was too heavy for my taste. Immediately upon opening the box, the trigger pull was slightly over 7 pounds. After a session of dry firing followed by our live fire tests, the trigger pull had cleaned up a bit and was down to approximately 6¾-pounds. That’s a bit heavier than I prefer but, upon reflection, I can perhaps understand it. The Thrasher is a subcompact pistol. In all likelihood, it is a pistol that will be used primarily for self-defense carry, not as a range blaster and almost certainly not as a target shooting or competition pistol. It has been extensively documented that adrenalin rush under stress increases muscle strength, and that in a life-or-death situation pistols with light triggers are often fired by mistake, due to a combination of adrenalin rush and involuntary muscle contraction. This is why, for example, the New York Police Department specifies a heavier than normal trigger pull on the Glock pistols issued to NYPD patrol officers. (In fact, this is often referred to as a “New York trigger.”) Although I prefer a trigger set for between 4½ and 5 pounds, I also shoot full-size 1911s. For consistency, I prefer to have the trigger pull weight on ALL my pistols set the same, so the muscle memory of shooting will be a constant. For someone buying one pistol to be used primarily for carry, it is far preferable to have a trigger a bit on the heavy side than to have a “hair” trigger that might result in a negligent discharge under stress. 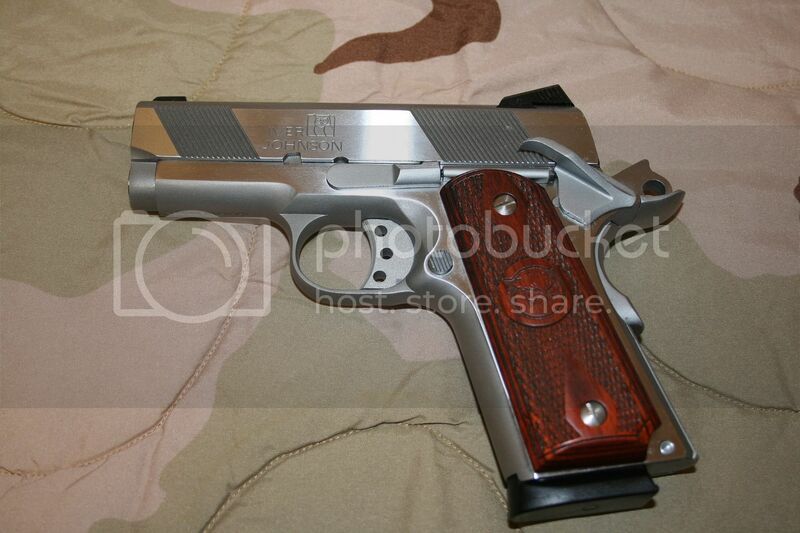 And the Thrasher is, after all, a 1911. Although we don’t make it a practice to tinker with pistols on loan to us for testing, I have no doubt that a simple trigger job would allow the trigger pull to be set for whatever anyone’s preference is. Nonetheless, we think Iver Johnson should revise their specifications and set the trigger pull closer to five pounds rather than seven. Since the Thrasher is likely to be carried, we also looked at how it fits in different holsters. We grabbed two to try. The first was a Commander-size leather scabbard from Nighthawk Customs. As expected, the Thrasher fit that just fine, with space left over at the muzzle. 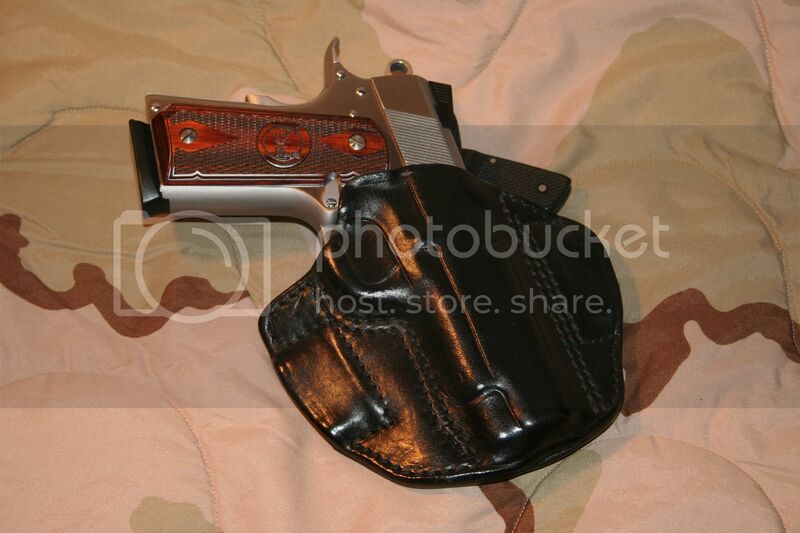 The other holster we tried was also leather, a scabbard from Kramer Leather. This one was molded for a 3-inch 1911. 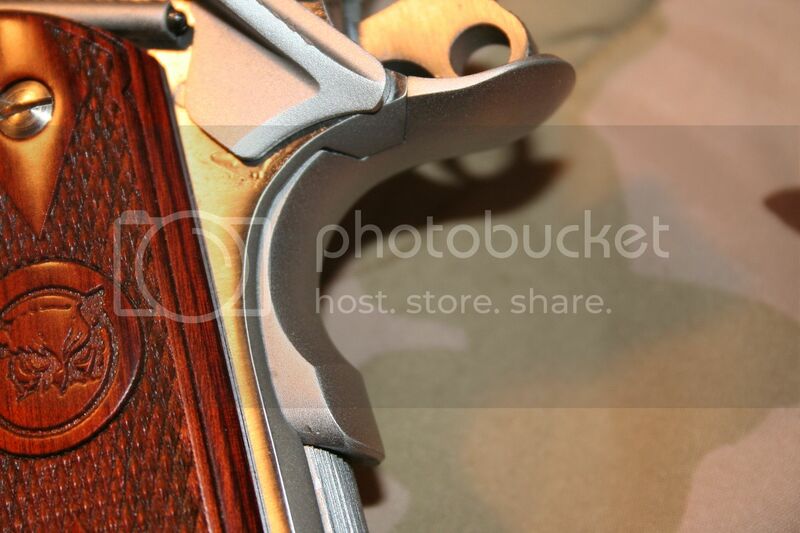 While we were able to insert the receiver fully into the holster, the slide "sprung" just a tiny bit to the rear as the receiver was fully seated. That extra eighth of an inch in barrel and slide length makes a difference. What this means is that the best holster choice for the Thrasher, since nobody makes holsters for 3⅛-inch pistols, is probably one molded for an Officers ACP. The bottom line is, except for the trigger pull weight, “what’s not to like?” The Iver Johnson Thrasher is a beautiful pistol to behold. Harking back to Grandmother’s adage that “Handsome is as handsome does,” I would have to say that the Thrasher does very handsomely indeed. I can’t remember ever testing a pistol that made it seem so easy to shoot well. I have commented to John Caradimas (the owner of The M1911 Pistols Organization and the publisher of this on-line magazine) when he has said how much he wishes he could conduct these tests himself (John lives in Greece) that these evaluations are not fun. We are entrusted with a sample of a firearm from a manufacturer, who expects us to report our findings objectively. Obviously, we can’t just randomly blast away with a test pistol and then show targets with group sizes about the size of a laundry pail. No, we do our best to shoot each pistol as well as it can be shot. What I have found is that some pistols seem to be easier to shoot well than others. Some days it’s a real struggle to bludgeon a recalcitrant pistol into cooperating. That was not the case with the Iver Johnson Thrasher. This little pistol was simply a joy to shoot right from the very first round. Perhaps I was having an uncharacteristically good day, but I don’t think I have ever turned in a bunch of targets with such consistently excellent groups. First, special thanks to Chad Holwerda of Iver Johnson Arms for offering us the opportunity to review this pistol. Some of the ammunition used in the course of our testing was graciously provided to M1911.ORG by Lucky Gunner, Inc., and by Winchester. Thank you both for helping make these tests possible. As this article was being prepared for public view, we received news of the sudden and unexpected death of our friend and colleague, Steve Clark (who is also known as "Rio Vista Slim" on the M1911.ORG forum). Steve passed away without warning on March 11, 2013. My last contact with Steve was an exchange of e-mails to discuss his constructive criticisms of this review. I have come to rely on Steve's comments to keep me on the straight and narrow with regard to my writing. His comments were without fail constructive, useful, and downright incisive, yet he was never insistent that his suggestions were the way it had to be. My writing has been better as a result of his assistance. He was a true gentleman, and he will be very much missed in the Editors' Lounge here at the M1911.ORG E-zine. 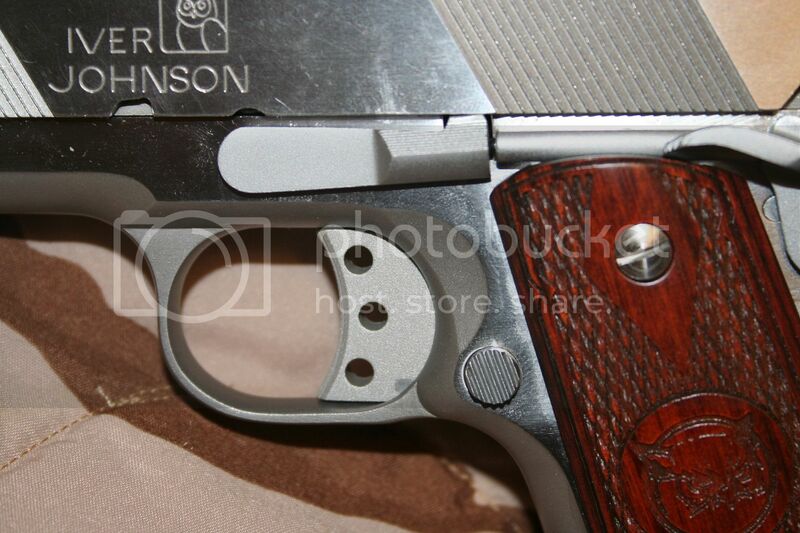 Iver Johnson Arms Company, Inc.